„Blöd, dass mir das gleich am Anfang passiert ist!“ Ralf Dujmovits, Deutschlands erfolgreichster Höhenbergsteiger, ärgert sich, dass er sich beim Trekking über den Baltoro-Gletscher erst eine Durchfall-Erkrankung und dann noch eine starke Erkältung zugezogen hat. „Es geht mir zwar schon besser, aber ich merke, dass mir noch die Leistung fehlt“, erzählt mir Ralf, als ich ihn während einer Erkundungstour am Satellitentelefon erreiche. Der 54-Jährige und seine Freundin, die 47 Jahre alte kanadische Bergsteigerin Nancy Hansen, sind in den Karakorum gereist, um sich an gleich zwei unbestiegenen Bergen zu versuchen: zunächst am Gasherbrum VI (die Höhenangabe schwankt zwischen 6973 und 7004 Meter), dann nicht weit entfernt am Praqpa Ri (auch hier gibt es noch keine exakte Höhenangabe: 7134 bzw. 7152 Meter). Die beiden haben inzwischen ihr Basislager zu Füßen des G VI bezogen. We have been warmly welcomed everywehre. When we visited a polo game in Skardu (city in northern Pakistan, starting point of most expeditions in Karakoram), people shouted: “Welcome!” Nancy was the only woman on the pitch. During our trekking all the porters welcomed us too. I feel the situation as very peaceful. There is great euphoria that this year finally once more nearly 30 expeditions have come to Pakistan. This summer, more than 100 climbers have registered only for K 2. Have you noticed a lot of activity during your trekking on the Baltoro Glacier? No. We met about 30 porters who carried equipment to K 2 Base Camp. But otherwise we didn’t notice anything of the heavy rush that is expected on K 2. The last summers in the Karakoram were very warm. How is it now? Today we have very nice weather again. However, we are slightly worried sitting here at an altitude of 5,000 meters in this scorching heat. We just had one and a half days of bad weather. At night, it snowed only for one hour, the other time it was always raining – early in June, at 5,000 meters! It’s just much too warm. 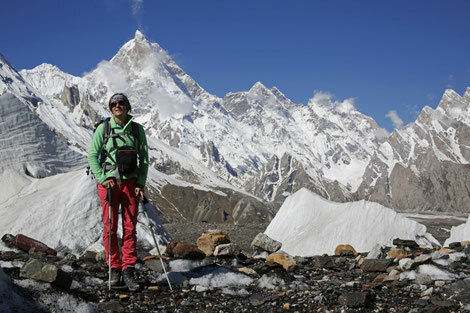 You had a first look at your first destination, Gasherbrum VI. How was your impression? Up to the col below the South Face, it looks quite good, covered with snow. It appears that we can find a way on the left side of the icefall which leads from the Baltoro Glacier into the little high valley where we want to go up. Then we’ll have to climb a 45 to 50 degrees steep slope to the col at 6,100 meters. But we were pretty flabbergasted when we saw the terrain further up: We’ll have to do a lot of rock climbing. We actually expected more ice climbing. In particular, a rock barrier above the col gives us food for thought. It straddles the entire South Face, in some parts even slightly overhanging. We still do not know how to come across this ledge. However, we have not yet seen the entire rock barrier. Perhaps there is a way through more to the right. Everywhere is much less snow and ice compared to what I remember from my last visits in this area. Do you want to tackle the mountain in Alpine style? We had originally intended to acclimatize on Snow Dome (a mountain near the seven-thousander Chogolisa). But in these conditions, we will probably have to work our way up Gasherbrum VI and to use a few meters of fixed ropes above the Col. I feel it’s unlikely that we’ll tackle our first summit in Alpine style. That will probably not be possible due to the quite challenging rocky slopes up there. We actually had planned to climb in a single push from the col to the summit. But it does not appear to be realistic. How much time will you take for Gasherbrum VI? After all, you want to climb Parqpa Ri, another unclimbed seven-thousander near K 2, afterwards. Actually, we want to finish our climb on Gasherbrum IV until end of June. However, it will be no problem to stay longer, if health reasons or the difficulties in the upper part of the mountain should make it necessary. We have a sufficient margin, so that we are able to add a few days more on Gasherbrum VI. If you are a team of only two climbers, you can handle it quite flexible. Are the two unclimbed seven-thousanders equally important goals or do you have a preference for one of them? When we were planning the expedition, Nancy was rather enthusiastic about Parqpa Ri and I more about Gasherbrum VI. But I think the goals are quite balanced. We feel really motivated to do both. Especially Nancy who is in good shape now wants to make progress. Currently I am still slowing her down a bit. But the euphoria for both summits is there. And we have enough time for both goals.